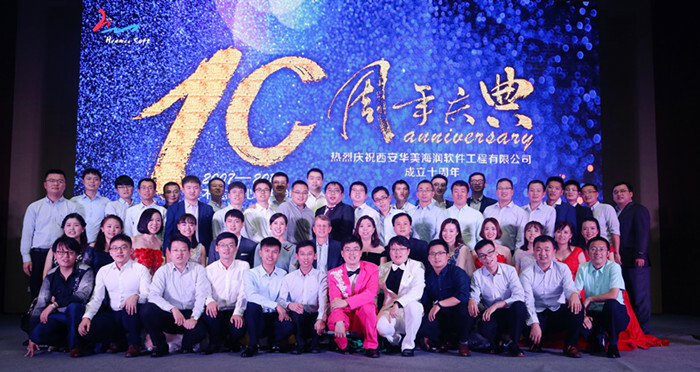 September,2017,10th Anniversary Of Huamei Soft-Xi'an Huamei Soft Co.,Ltd. Light and shade come in swift alternation, days and months flash by as quickly as a weaver's shuttle. Huamei soft has been 10 years with everyone since founded. 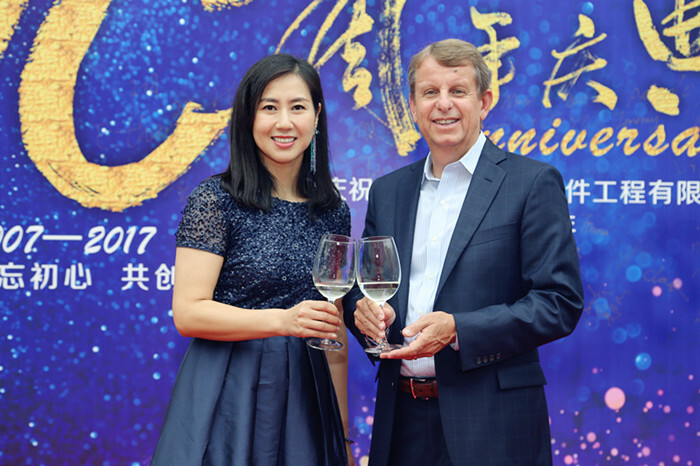 On 22nd September, 2017, Huamei soft 10th anniversary ceremony was held at Xi’an impressions of LOUGUAN resort. 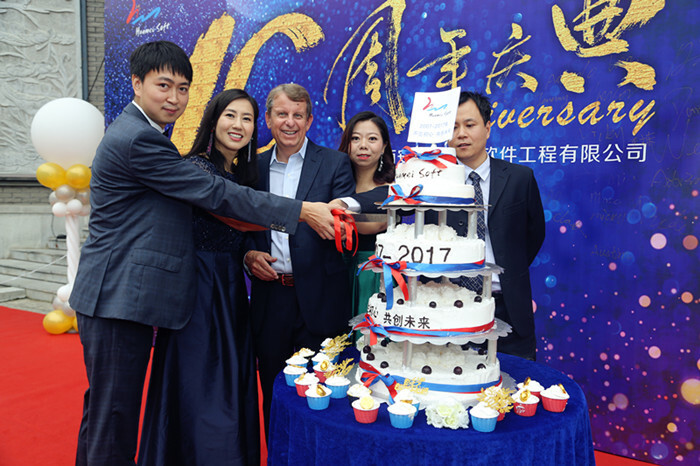 President John Pence, General manager Rui Ma and all Huamei Soft employees participated in this grand celebration. 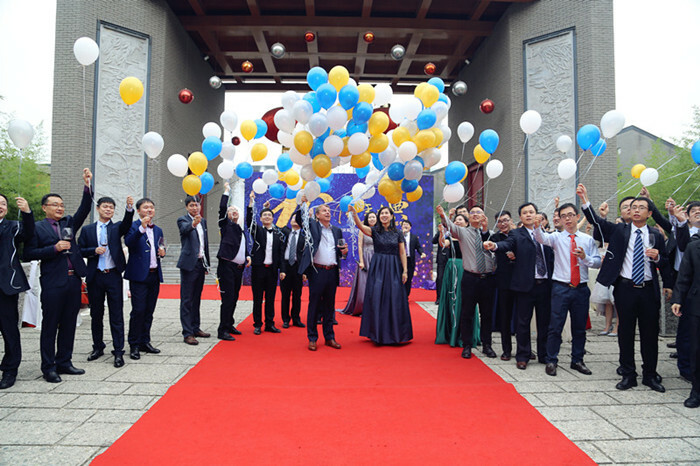 The ceremony began with the red carpet welcome, every employee was dressed up gorgeously, with dynamic music and opening show, our 10th anniversary ceremony was start. At first, President John gave a wonderful speech. He also awarded all excellent employees who have made outstanding contribution to Huamei in the past 10 years. Wonderful shows and performances during the ceremony attracted the eyes of all employees, drew applause and cheers from time to time, and helped the ceremony reached its climax. John's birthday is the same day with Huamei 10th anniversary by lucky coincidence, we secretly planned a "birthday surprise" for him. With all these happy moments, Huamei family is getting stronger. When watching the video―“Memory of Huamei Soft 10 years”, everyone moved to tears. We are grateful to all employees for their contribution to Huamei. At the end of ceremony, General Manager Rui also prepared a mystery prize for us. Everyone was excited because we will take a vocation to Japan in January! The first Huamei Soft decade has passed, let’s looking forward to the next 10 years.